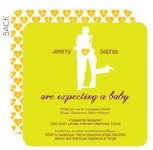 Thinking of throwing a couples baby shower? This type of baby shower has been steadily gaining popularity over the last few years. There are definitely lots of perks to having guys involved with a coed baby shower. They tend to "liven up" the games, activities and add a new element of fun to the party. But, the most important part of having guys involved in the baby shower is to give them the chance to be part of the special celebration. A new child is exciting for both parents, so why not let both parents celebrate it with friends and family? The office baby shower can also be made into a coed shower if it is the dad that works there. The co-workers can also invite the mom to be to the shower to join in on the fun. ***NOTE***Before you start planning this type of shower, you will need to get with the mom and dad to be to make sure this is something they would like to do. This might be the only baby shower they get, so it is important that they both agree to it. The mom might have her heart set in an all girls party and the dad might not want to be the center of attention. Since this is a coed baby shower, it is important that the date works for both parents. If he or his friends are into sports, check to make sure that the shower does not conflict with the big game. You will need a list from both of them of their friends. Make sure you get plenty of guy names on the list so he won't feel out of place with so many women. There are many great themes that would work out well with this type of party. Since men are involved, it is best to use a generic baby theme or other themes he can relate with (like sports, barbeque, camouflage, jungle, book, beach, cars, western and john deere are some ideas to get you started). Plan the invitations so they match your theme. You can make them more "guy friendly" by placing both names on the envelope and indicating it is a couples baby shower on the invitation. Use your theme in decorating the room. Try to create an environment in which the men will feel comfortable. They understand that they are attending a baby shower, so they will expect a little girly-ness. A little pink might be ok, but don't overdo it. They shouldn't feel like they are handing over their "man card" to be part of the celebration. Guys love to eat, so the food will be the main attraction. When they remember the celebration, food is going to be a huge factor of it's success. So stock up on guy friendly "meat eater" dishes for them to enjoy. Get great recipe ideas to use in the recipe section. Are games are played at a coed baby shower? Well, it depends. 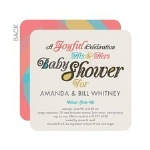 There are many fun games that you can use, although a couples baby shower can work successfully with or without games. Many coed showers forgo the games and let casual conversation take over, leaving a relaxed and fun environment. If you would like to have games at the shower, chose some fun "active" games for the guys to get into. Visit our couples games section for some great ideas. What kind of prizes and favors are used? Choose prizes and favors that match the theme and work well for both men and women. Food always is a great choice! You can also have an assortment of items like bath products, candles, and lip gloss for the women and pocket knives, shaving products, a gift certificate to home depot and care care products for the guys. Some generic prize or favor ideas could be gift certificates for movie rentals and fast food places, itunes gift cards, and chocolate. What kind of gifts are used for this type of celebration? The gifts do not need to be any different from a traditional baby shower. The parents still need to stock up on all of the supplies they can get. The guests can get a few fun gifts just for the dad, but the focus is still on the baby. Some fun dad gifts include the diaper tool belt, onesies and bibs that say "I love my daddy", t-shirts with fun sayings, and new parents preparedness kits.